Paul D. Brazill’s Drunk on the Moon 2 is now available from Amazon for the Kindle. 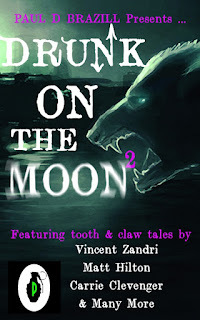 This is the second collection of crime/horror tales to feature Brazill’s Roman Dalton, a werewolf private investigator. This time around the anthology opens with an introduction by Richard Godwin and contains stories by Matt Hilton, Vincent Zandri, Carrie Clevenger, JJ Toner, Veronica Marie Lewis-Shaw, Chris Rhatigan, Ben Sobieck, Ben Lelièvre, Paul D. Brazill himself, and me. In my story, “The Girl With The David Bowie Eyes,” Petra Kier is sick. Petra is the first girl Roman ever loved and she needs him to track someone down before she dies. Her last wish sends Dalton careening down memory lane to confront his past and his future while dropping him into the middle of a blood-soaked feud between two elder supernatural creatures.